The Enlightening Bridge Between Art And Work At a time when recession is reminding us how badly we need work, it should be artists who teach us to discern the virtues of the furniture of contemporary technology. 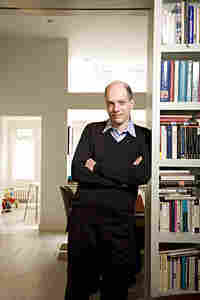 Alain de Botton is the author of The Pleasures and Sorrows of Work. If a Martian came to Earth and tried to understand what human beings do just from reading most literature published today, he would come away with the extraordinary impression that we basically spend our time falling in love, squabbling with our families, and occasionally murdering one another. But of course, what we really do is go to work — and yet this "work" is unseen; it is literally invisible, and it is so in part because it is rarely represented in art. If it does appear in consciousness, it does so via the business pages of newspapers, it does so as an economic phenomenon, rather than as a broader human phenomenon. Two centuries ago, our forebears would have known the precise history and source of almost every one of the limited number of things they ate and owned. They would have been familiar with the pig, the carpenter, the weaver, the loom and the dairymaid. The range of items available for purchase may have grown exponentially since then, but our understanding of their genesis has grown ever more obscure. We are now as imaginatively disconnected from the production and distribution of our goods as we are practically in reach of them, a process of alienation which has stripped us of opportunities for wonder, gratitude and guilt. How ignorant most of us are by contrast, surrounded by machines and processes of which we have only the loosest grasps; we who know nothing about gantry cranes and iron-ore bulk carriers, who register the economy only as a set of numbers, who think — even now — that it is only about money, who have avoided close study of switch gears and wheat storage and spare ourselves closer acquaintance with the manufacturing protocols for tensile steel cable. At a time when recession is reminding us how badly we need work, it should be artists who teach us to discern the virtues of the furniture of contemporary technology. One can hope for a day when photographs of electricity conductors might hang over dining tables and when someone might write a libretto for an opera set in the sales office of a packaging firm. We need art that could function for our times a little like those 18th century cityscapes which show us people at work from the quayside to the temple, the Parliament to the counting house, panoramas like those of Canaletto in which, within a single giant frame, one can witness dockers unloading crates, merchants bargaining in the main square, bakers before their ovens, women sewing at their windows and councils of ministers assembled in a palace — inclusive scenes which serve to remind us of the place which work accords each of us within the human hive.